The Porsche is a popular choice for Lego enthusiasts looking to test their modelling skills, but leave it to the toymaker’s official builders to absolutely nail the curves and contours that make the 911 so recognizable on this new Technic set. Zusammengebaut.com’s Andres Lehmann and Jim van Gulik were responsible for these shots of the new Technic Porsche 911 snapped at the 2016 Nuremberg Toy Fair that just got underway today. Details on pricing, availability, and even piece-count don’t appear to be available just yet, but it’s safe to assume this is going to be one massive and detailed set. And looking at the set’s official boxart, it appears as if Lego will be keeping the dazzle camo paint job on the model. 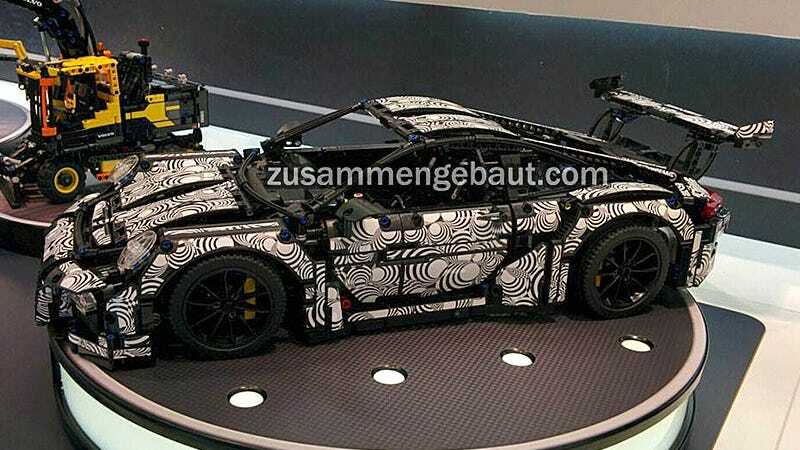 It’s typically used by automakers to make it hard to distinguish the appearance of new vehicles while they’re being tested in real-world conditions, but apparently Lego’s designers like it enough to make it the official finish on this model.